In May 2012, fans of AS Pikine voted petit midfielder Cheikha Sy as “Meilleur Joueur” of the season. Cheikha Sy is the playmaker of AS Pikine. Sy is primarily an attacking midfielder or a winger, often found in a free role between the midfield and the forwards, either in the centre of the pitch or on the wings. Sy is a highly technical player with good vision, passing, crossing and dribbling ability. My first record of Sy is from September 2004, when he was included in a squad for the Senegal U-17 national football team. At the time, Sy was playing for the youth team of AS Douanes. In July 2006, Sy was playing for AS Douanes in the Senegalese youth cup final. In August 2006, Sy was included in the squad of the Senegal U-20 national football team. In September, October and December 2006, Sy played for Senegal U-17 in qualifying matches for the 2007 African U-17 Championship. Sy captained the team and made some impressive performances. In 2008, Sy was yet again part of the Senegal U-20 national football team. In June and July 2008, Sy played for Senegal U-20 in qualifying matches for the 2009 African U-20 Championship. At this point, while still playing for AS Douanes in the Senegalese Ligue 1, expectations were high and most experts expected Sy to travel to Europa. In 2009, Sy signed for Al-Ain from the United Arab Emirates. In retrospective, this was perhaps not the best career move. Sy was immediately loaned out to Syrian outfit Al-Wahda. Sy scored in his debut match in the Syrian First Division 2009-2010, on 09.10.2009 against Al-Majd. Sy scored six league goals during the season, including a hat-trick against Al-Ittihad on 02.04.2010. 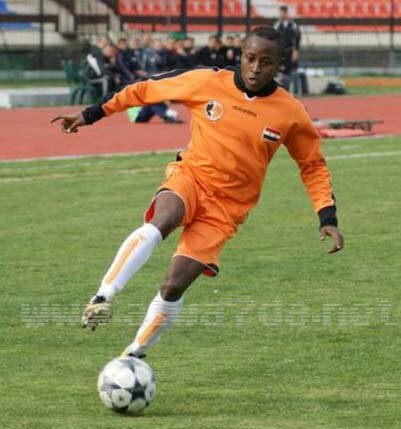 According to http://www.goalzz.com, Sy teamed up permanently for Al-Wahda before the Syrian First Divison 2010-2011, scoring two league goals before he returned back to Senegal. Sy has been an instant success at AS Pikine. He played 13 (out of 14) matches during the Senegalese Ligue 1 2011-2012, scoring two goals. Sy was considered for a place in the Senegal U-23 squad for the 2012 London Olympics but failed to make the final cut. The birthdate of Sy is currently unknown. According to http://en.wikipedia.org/wiki/Cheikha_Sy, Sy is born 05.06.1990. I am not sure about the source of this information, but it seems likely based on his CV. According to the same source, Sy is 165 centimeters. Cheikha Sy is often referred to as «Cheikh Sy». Don’t be surprised if this promising player leaves Senegal during the winter to sign for a club in a bigger league. The picture of Sy, wearing the shirt of Al-Wahda, was found on his fanpage on Facebook.